As much as I love Summer I do not have the time to continue her. If anyone would like to continue work on her and complete her then message me and I will most likely give you permission to complete her. I just really want to see her finished and my life hasn't given me time to do that. Uh.....its probably because I havent updated her to the latest version. That or its because you are using an illegal version. It works for me. Hmm. Could you give me the log or tell me what error pops up when it happens? Oh alright that makes more sense. But still what is this warg? Um....I think you can only get koalafant in Sumer and Winter because of this some code: Spring and Autum let you get the warg. Plus those are the only koalafants outlined in the code. No actually her father tried to kill her mom and then tried to **** her herself and killed himself ._. This mod adds the character Summer Smiles who is a creation of my friend to the game. I NEED help finding bugs. Big Thanks to hollow shell on Steam for the new artwork. 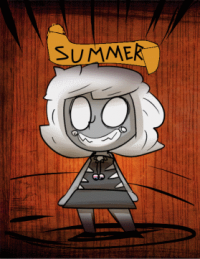 ----------------------------------------------------------------------------------------------------------------------------------------- Backstory: Summer was your average girl. She was a joy to be around anytime, until her sister died that is. After her sister's death she went into a depressive mood and started shunning everyone. Maxwell sensed this and before she could commit suicide at age 15 he made her a deal. "If you kill and eat your parents as a sacrifice I will return your sister to you." He told her. She agreed since she loved her sister more than anything, and then her parents went to sleep she murdered them and devoured their bodies. Well all but a eye from each. These she made into a necklace that she wears to this day. Well Maxwell never intended to bring joy and cuz he is a two bit, no good liar he put the soul of Summer's sister in her. This coupled with the mental anguish of killing her parents and the inherent insanity of cannibalism caused her mind to break. She began referring to herself as we and began a killing spree that lasted until she was 21. Before she could be caught Maxwell pulled her into his world in hopes of allowing her to cause even more lovely havok for him to watch. This is where you come in. Survive with her as long as you can and bring joy to old Maxxyboy as long as you can. And remember, Everything is not as it seems. --------------------------------------------------------------------------------------------------------------------------------------------------- Currently she: *Regains Sanity at night *Starts with Spear, Razor, and Pitchfork Blueprints *Can eat monster meat *Starts with 120 health and 60 Sanity *Able to withstand fire. -------------------------------------------------------------------------------------------------------------------------------------------- ToDo: *Add it where she can seperate from her sister and summon her spirit but it causes her to weaken but increases her sanity and changes quotes (Need help since Im a relatively new person to this) *Make her lose Sanity during the day *Make her gain Sanity around monster/evil things/ going through wormholes/ etc. *Find a way to cause a extreme insanity at 0 Sanity where she gets stronger and faster but has barely any health. *Add custom quotes for everything in game -------------------------------------------------------------------- Notes: she has custom quotes so experiment in inspecting things.